In the early Nineties, a trip to Las Vegas prompted me to rent a car for the scenic drive out to Hoover dam. 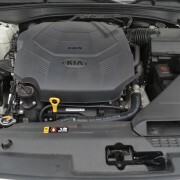 The sub compact 2-door to which I was given the keys was a Kia, an unfamiliar brand new to me at the time. 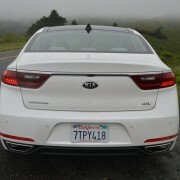 I was so impressed with that petite and sporty Kia that returning it to Hertz was painful. 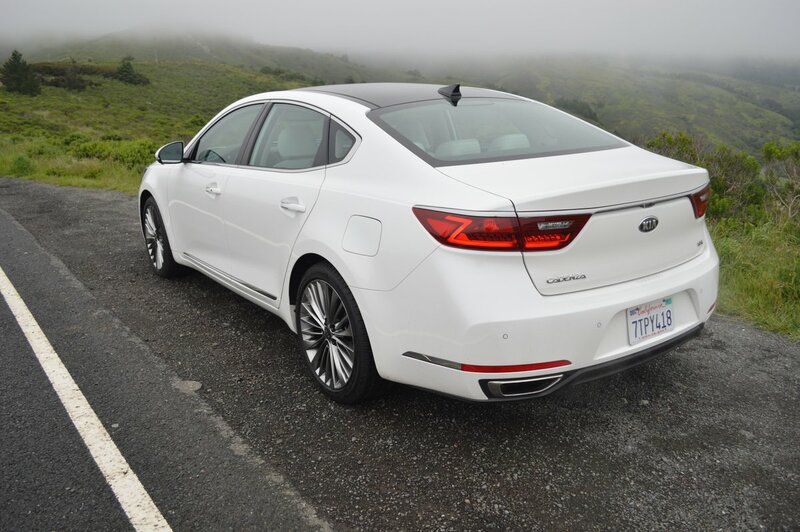 Later, I learned that Kia had abandoned the American market altogether, a move that seemed inexplicable based on my acquaintance with the make in Nevada. Well, guess what? Long-term, that Las Vegas preview proved correct. 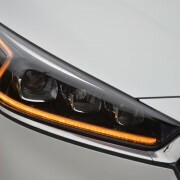 Today, Kia is back in North America, firmly established with a full model line that runs the gamut from the microcar Rio to the ultra-luxe K900 limousine, with a complete line of SUVs to boot. 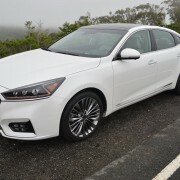 And right in the middle of the sedan range stands the all new Cadenza, a surprisingly luxurious four-door with legitimate sporting pretensions. 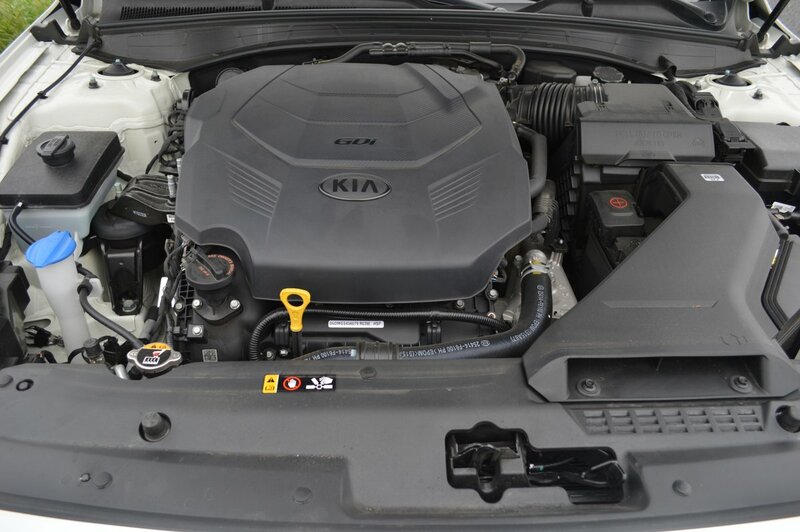 Our sample Cadenza Limited, at $44,390, tops the model line which starts at $33,000. All 3,365lb. 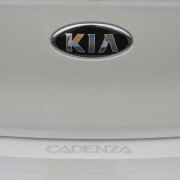 Cadenzas utilize a 3.3 liter 290hp V6, normally aspirated with direct injection. 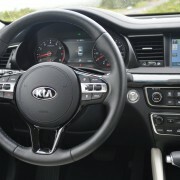 Kia couples this responsive engine to an 8-speed automatic transmission with manual gate and paddle shifters. A standard set of dark satin 19-inch alloys plant 245/40R19 Michelin Green X, all-season tires close enough to the pavement to produce a sporting but stiff ride. 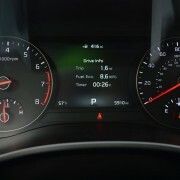 A standard tire pressure monitoring system keeps you appraised of air pressure in each tire. 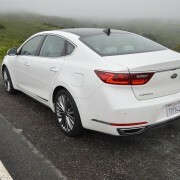 The new Cadenza sits low and looks sleek. It stands just 58 inches tall, with a stealth silhouette that belies its spacious interior. 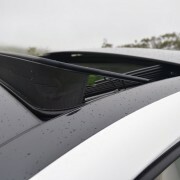 Contributing to the stealth look is a black glass roof panel that extends the length of the cabin. This panel contains an enormous sliding sunroof which bathes the front and rear seats in light when you slide the suede cover panel back. 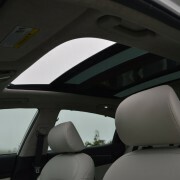 The front half of this skylight can be fully retracted as well. 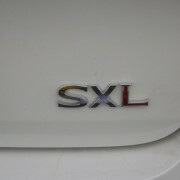 You can easily accommodate 5 passengers inside, with 16 cubic feet of trunk space for their belongings. 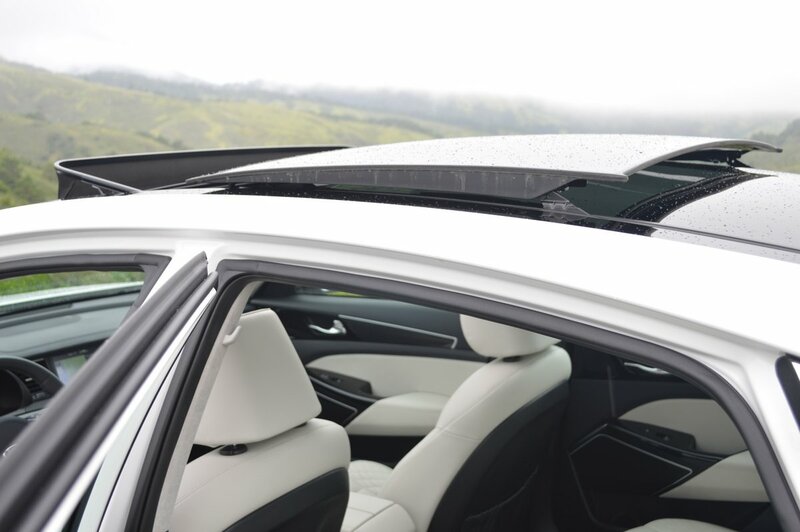 The back seat of the Cadenza is especially strong on leg room, with enough slouch space to make long journeys tolerable for all occupants. 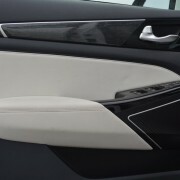 The outboard back seats, like the fronts, include multi-stage heaters. 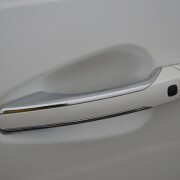 The rear windows retract completely into the door frames for unimpeded fresh air intake. Privacy screens are fitted to all rear windows. 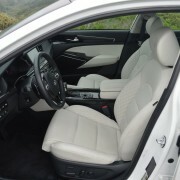 Kia does an exceptional job on interior design. 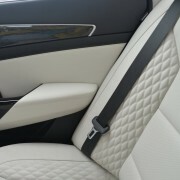 Our Limited featured white Nappa leather seat trim which contributed an unexpected note of elegance and comfort to all seating positions. This material is exceptionally soft, and looks quite elegant with its diamond-pleated side bolsters. The instrument panel features real double stitched detailing. 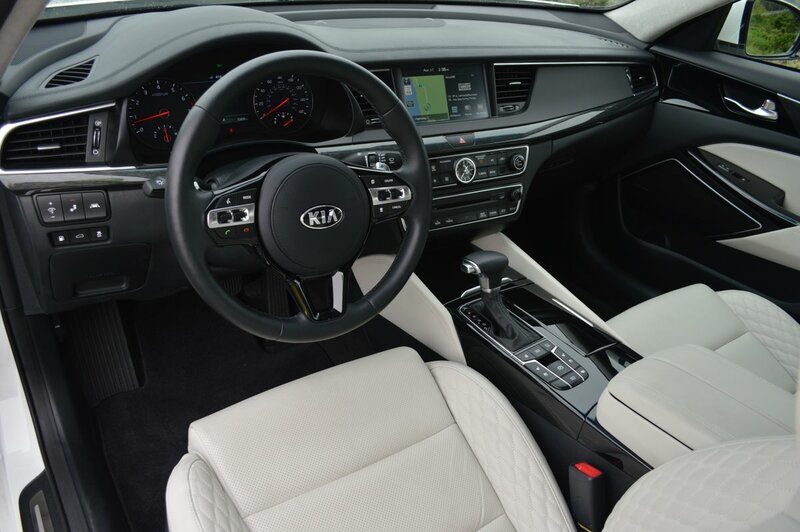 Piano black trim harmonizes well with muted driftwood inserts to make the Cadenza interior an exceptionally restful environment. 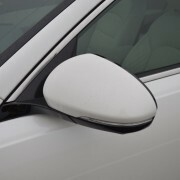 The fat and resilient steering wheel rim is cut with thumb grip recesses. 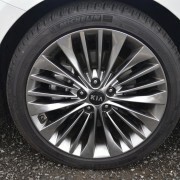 Kia’s cruise control array, fitted to the right spoke, is intuitively designed and easily operated. 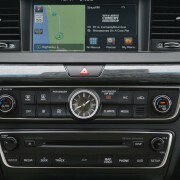 The cruise system never surges or hesitates after you set your speed. It will brake you if necessary, and you can set your following distance with confidence, even if you select the shortest setting of 1.5 car lengths. 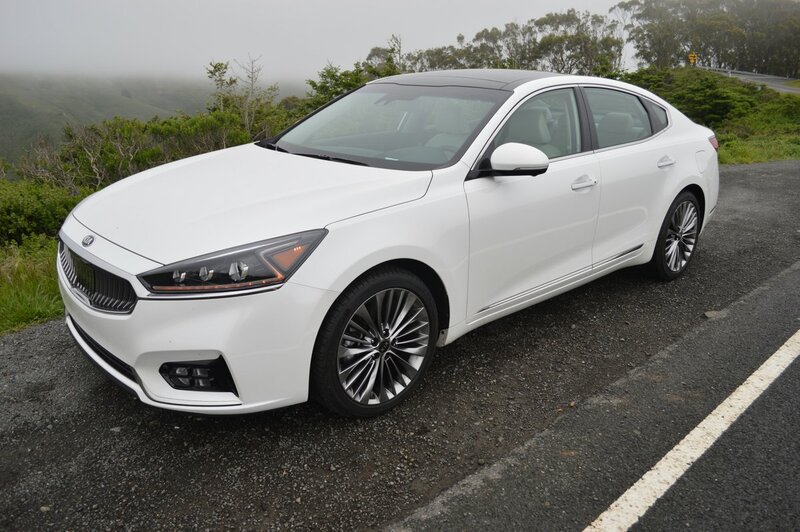 New for 2017 are the Cadenza’s suite of safety programs, including Forward Collision Warning System, Smart Blind Spot Detection, and Rear Cross Traffic Alert. I have to admit that the Blind Spot Detection provided me with useful information which my rear-view mirror failed to reveal. 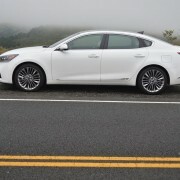 The latest Cadenza is emblematic of the kind of value you can expect to derive from a Kia purchase. In addition to the solid virtues of intelligent packaging, responsive performance and handling, the icing on the cake comes from the generous 5 year/60,000-mile warranty backed up by a similar term for roadside assistance. 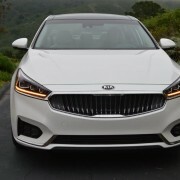 If $44,290 looks like a lot for a mid-size Kia sedan, just compare it to the competition and you will recognize a bargain here rather than an extravagance.